Bright and bold, we stock a great range of tops. For the heat of summer, try our open back Thai drape tops, comfortable Indian blouses or our sizzling crop top styles from Bali. We also stock a range of long sleeved tops; perfect for laying up on the cool winter days. 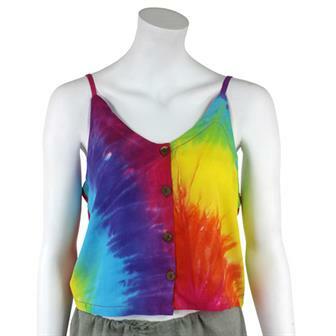 Good summer festival vibes are radiating forth from this funky rainbow crop top! With a thin strap style and four front buttons, these tops are both eye catching and comfortable. 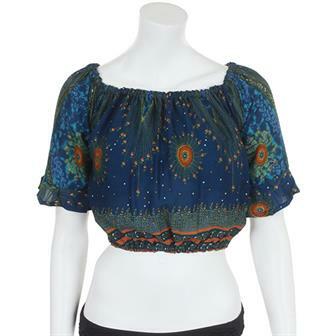 Lightweight rayon top printed with an intricate mandala design, this ladies shirt features a simple ties that fasten at the top of the midriff. 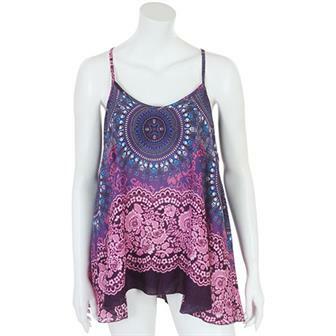 Busy summer crop top made from rayon and printed with an intricate mandala pattern. White summer top made from silken feeling rayon printed with a bold black feather / palm leaf design, this snazzy little piece has neck tie details. 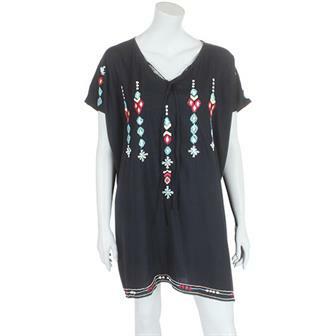 Comfy ladies tunic top with a relaxed loose fit, embellished with embroidered 'tribal' designs along the bust, sleeves and front hem. Made in Indonesia from lightweight and silken feeling rayon. 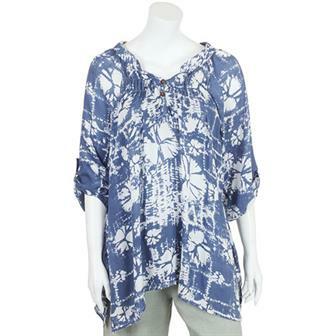 Ideal for summer lounging, these loose fitting smock top are made from a comfy fabric blend of cotton and rayon. The tops have a relaxed neckline, gathered slightly above the bust and extending up to the shoulders. Available in two different tie dye patterns and finished with coconut buttons. Bring on the beach! These lightweight summer wrap tops are made from lightweight, breezy rayon and are perfect for sunny seasides and happy holidays. Their simple shape with long securing ties make it versatile to wear in a variety of ways. Available in bold patterned jungle leaf print or striking black or grey. 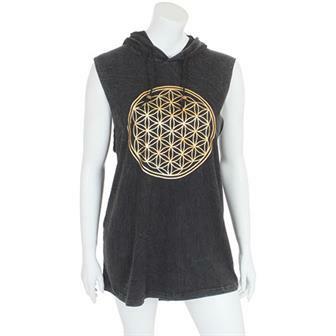 Long stonewashed cotton vest top with hood screenprinted with a elegant golden flower of life design. These long ladies shirts have a classic Nehru style collar and are ideal for elegantly lounging about or going out on the town in. 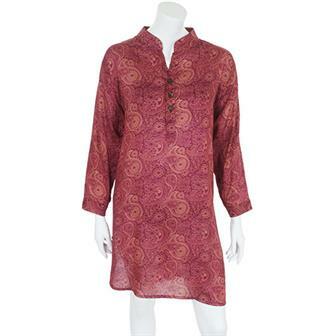 Made from silken feeling rayon and available in two colours, the subtle paisley print adds a touch of majestic charm. 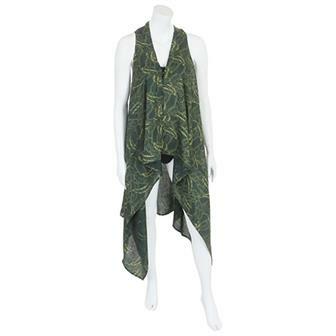 Perfect for finishing off an outfit, these long draping ladies waistcoats are made using a feather printed fabric from Thailand and are fastened with a single coconut button at the front. 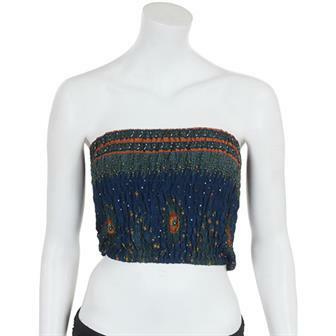 Floral print tie around crop top made in silken feeling rayon. These garments have a elasticated neckline and simple halterneck strap with lengths of material to tie around the back. 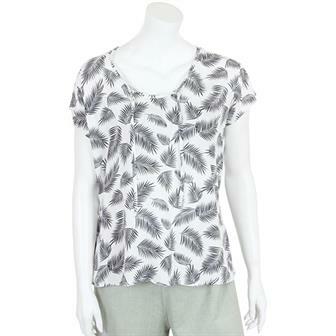 Set your shoulders free this summer with our silky feeling rayon tops printed with a stylish peacock pattern. The bardot top has an elasticated, off the shoulder neckline and sleeve frills, perfect with big sunglasses and a boho attitude for that film star look! These peacock print bandeau tops are a brilliantly comfortable style, perfect for strutting through the sunshine at a summer festival or beach holiday! Lightweight summer smock top in silken feeling rayon material, with a shaped neckline and coconut button embellishments perfect for beach adventures available in either black or white. Silken feeling rayon butterfly top in a selection of busy prints. 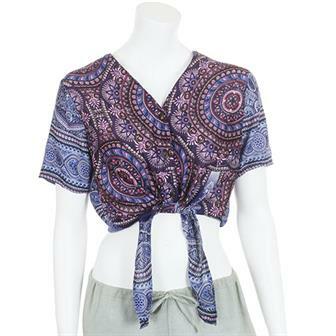 A mashup of bold and beautiful prints made into these awesome strappy summer tops, made from lightweight and silken feeling rayon these camisole like tops are great for hot summer days. These light and comfy ladies tops are part of our exciting range of Nature's Dye clothing. Handmade in India, these great items use only natural dyes to create beautiful, eye catching patterns. With their block print circular patterns and subtle tonal colour changes, these lovely long sleeved tunics can be combined with trousers or leggings for a versatile top. 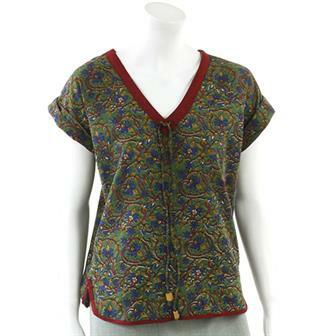 Super summer cotton top with a scoop neckline in a range of toned and printed Nepalese fabrics adorned with busy circular patterns. 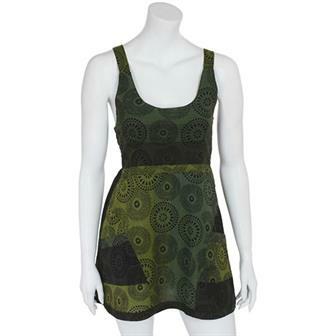 This top has an elasticated bandeau back at bust height and a useful front pocket. 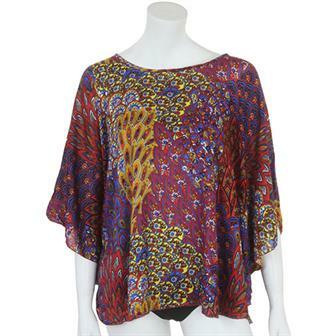 Made in an eye catching Indian print, these lovely floaty tunic tops are great for keeping covered up on warm sunny days.